There are few sights more heartbreaking than children freezing—no jackets around their bodies, no hats on their heads and no gloves to keep their hands warm. During winters in Virginia, the temperatures dip below freezing, and Staunton, Va., Lodge No. 351 wasn’t going to leave kids in their community in the cold. 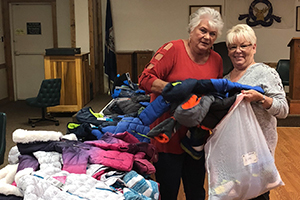 Using a Promise Grant, 20 members of the Lodge spent the next week buying coats, hats and gloves, pajamas, sweatshirts and sweatpants for the students. They even included two books and a stuffed animal for each kid, adding that personal Elks touch. 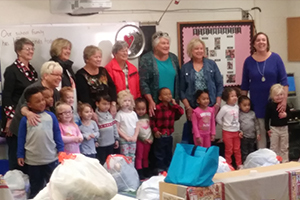 “The smiles and gratitude on the faces of the 20 children we gave the bags to showed how successful this program was,” says Barbara Monger, project manager for the Lodge. The school was grateful for the Elks and asked if they could see it in their hearts to do the program again next year. Knowing how much Elks care, we’re sure they’ll be back. Not only were the students and faculty members at the school happy, but the Lodge members and volunteers were more than happy to help. “Every Elk seemed proud and pleased to be a part of an organization that does things like this for those in need,” Monger says. Elks are committed to America’s future. To build the character and competence of local youth, the Elks National Foundation awards $2,500 Promise Grants on a first-come, first-served basis for Lodges that pledge to host an eligible youth project. To find out more about Promise Grants and the Community Investments Program, visit enf.elks.org/PromiseGrants.